DD5LP – July 19th. 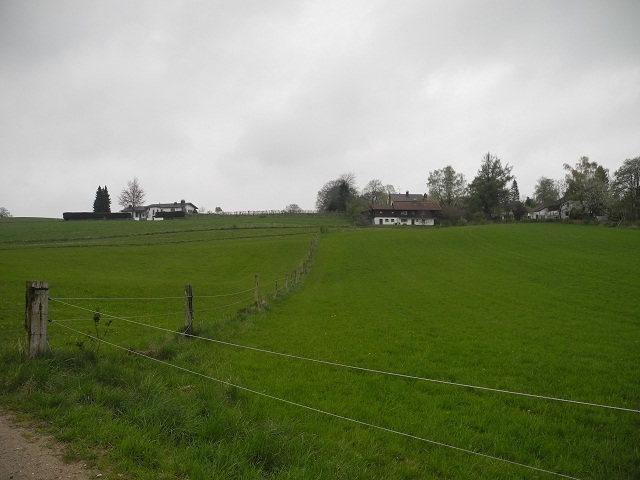 2015 – DL/BE-094 Irschenhausen. 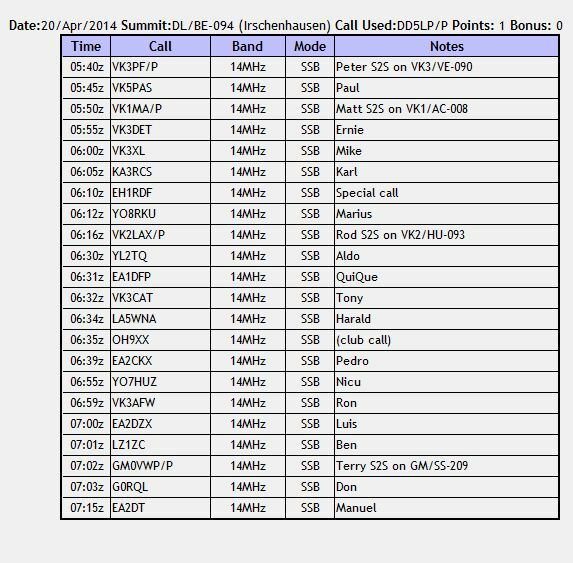 After several planned activations being aborted for different reasons, I decided to activate the one semi-local summit that I have not yet activated in 2015 in order to test out both my now modified again (addition of cooling fan) Ramsey QRP Amplifier and the SOTALogger Android app, spotting function. I had activated Irschenhausen in April of 2014 while I still lived in Andechs where we had rented a flat while looking for a house to buy. The summit is now almost exactly an hours drive away (if there are no road delays) to where we now live as opposed to 30-35 minutes. 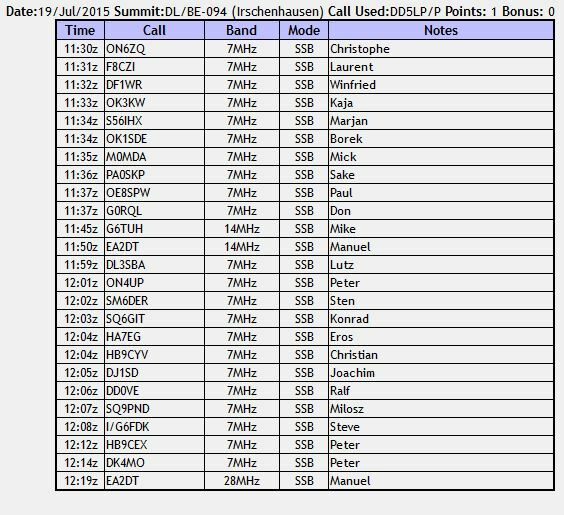 Interestingly my planned route would take me directly past my other local summit Berndorfer Buchet (DL/AM-180) but I have already activated that summit this year. 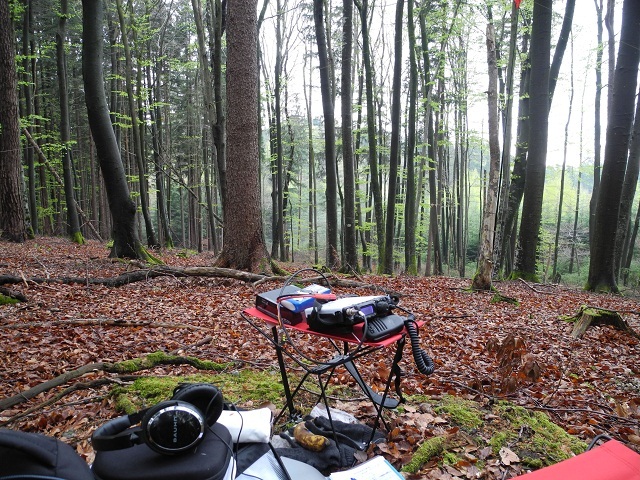 Irschenhausen has good memories as last year after tramping up it through the remainder of snow and mud, early in the morning, I managed to activate it with 4 contacts back into VK (two of which, were Summit to Summit contacts). That would not be the case again however as the activation was planned for the afternoon, so just local European contacts this time. 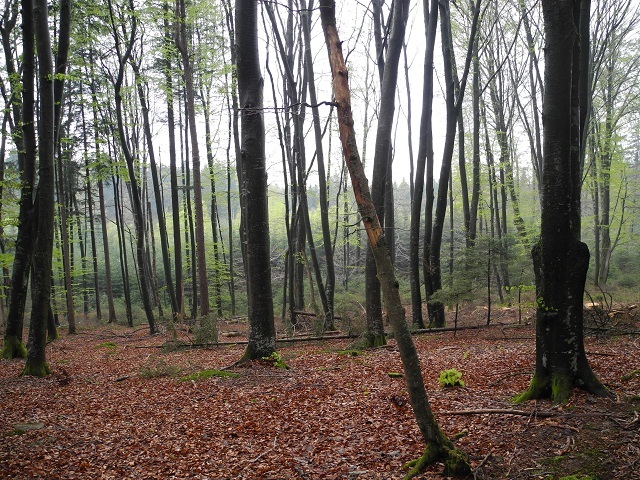 Both Irschenhausen and Berndorfer Buchet are located in forests with limited views and both are possible removals from the SOTA scheme in February 2016. Despite being “interesting” to reach in winter, neither have a winter bonus as they are relatively low in height. 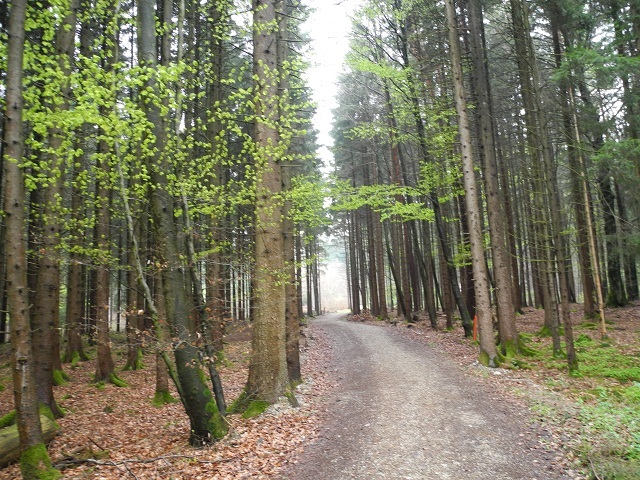 The Irschenhausen “summit” is in the cente of the forest alongside the village of Irschenhausen which in turn lies just off the B11 south of Ebenhausen-Schäftlam. Simply turn off the road in the centre of Irschenhusen to the right (signposted to some Hof) and then keep taking the road that climbs higher until you come to a fork where the left hand side is restriced motor access and the right hand fork has a “dead end road” sign. Directly between these two roads is a parking place (next to the doggy plastic bag dispenser) for two cars. Park there are walk up the left hand road and take the left fork off it up into the forest. Keep right in the forest, taking the tracks that take you always higher until you reach the “summit”. If you could see it through the trees, you would see that Irschenhausen overlooks the Autobahn 95 that runs from Munich to Garmish-Partenkirchen and the easiest route to Irschenhausen is by taking exit number 5 to Schäftlam from the A95, go through Schäftlam over the railway, turn right and then after about 2 km turn right again, back over the railway line and into the village of Irschenhausen. Expecting delays on the roads as the holiday season is starting, I actually got a good run through, taking almost exactly an hour which was 30 mins ahead of my allocated time. 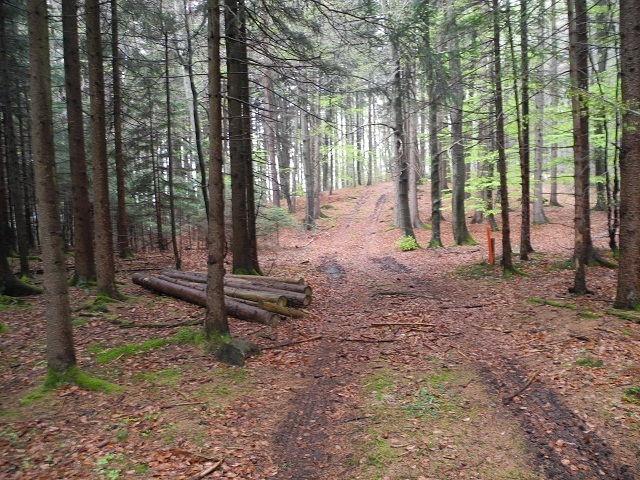 Once I had parked up, the walk up and into the forest was pleasant however I had the feeling that I may have taken the wrong route as the track seemed better than in the previous year. However I kept going always taking the track that seemeed to take me higher. At one point I decided to leave the main track to head up a smaller one towards what I though was the summit (and later trned out indeed to be the summit as I actually found the trig Point when I was packing my equipment up. I believe I did end up at the same point as the previous time and simply the fact that there was no snow or mud around made the route look different. On my way back down after the activation, I realised I had taken a different route and this might have been the route I used on the previous activation. Band conditions have been difficult for some time and this day was no different. After I got set-up I took a tune around and could hear plenty of stations on 40m but only a few on 20m. I decided to start on 40m and after spotting myself, the chasers flooded in as usual. Once I had worked all the chasers I could hear on 40m, I switched to 20m – tried out the spotting function in the Android SOTALogger app – in the process typing in 14.085 instead of 14.285MHz (thanks Mike G6TUH for picking this upand putting out a corrected spot). The amp had also been operating fine up to this point, the only issue being that I lost the label off the switch I have to switch low pass filters, so I had to best guess that. 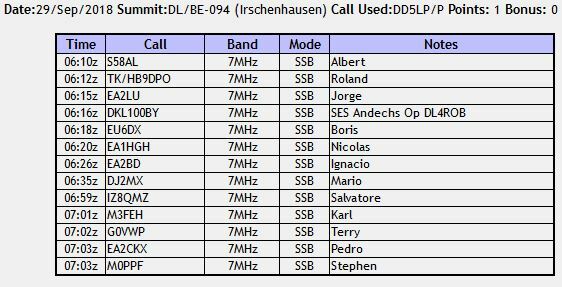 On 20m, I was getting a very limited response, which later I realised was just bad band conditions howeer in my investigations, I also found a bad contact on the coax. The Aerial-51 404-UL OCF dipole has a PL-259 plug supplied on the cable, so that I have to go through a SO-239 to BNC adapte before I can connect it to the amp or directly to the FT817 (I use the front connector on the 817). To make things worde, the Ramsey Amp uses Phono/RCA plugs (!!) for RF in and out, so I have Phono to BNC adapters on these to be able to use standard cables. Somewhere on the output side of the amp there was a intermittent connection affecting receive (and no doubt tranmit). I managed to locate the cables so that the connection was good but I will need to look into this. Most likely I will cut the 259 plug off the Aerial-51 antenna lead and add a BNC plug and then I will try to replace the Phono sockets with BNC ones, if I can find PC board mountable sockets at a reasonable price otherwise I may simply solder the Phono-BNC adapters to the Phono sockets. The day so far had been very pleasant, well shaded from the hot sun in the forest and no sign of rain (although a shower or two was forecast). It then got cold and a wind started up. I decided to give 10 metres a quick try (for the new 6/10m challenge) and then pack up. 10m was dead but Manuel EA2DT managed a contact with me and then I decided it was time to pack up and get back to the car before the rain. 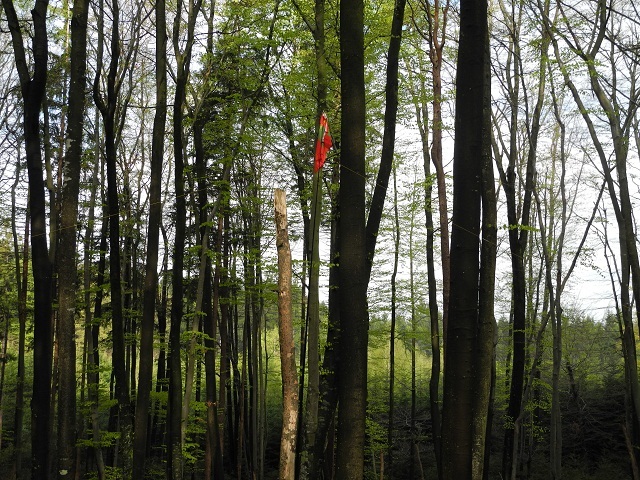 It was when I was reeing in one side of the dipole, that I saw a stome on the ground witth TP on the side of it. Of course I thought TP – Trig Point but then I thought, hang on, that would be in the UK not in Germany. After clearing small braches from around the bottom of it I took several pictures of the stone (see below) one side does have a tri-angle on it and after researching when I got home, I found Trig Point or to give it, it’s correct name “Triangulation Point” in english is “Triangulation Punkt” in German, so that was indeed the top of Irschenhausen – I was at the exact summit. On returning to the car, the wind stopped the temperature went up and no rain came – typical. In any case the purpose of the actication had been met, the amp works, but needs some work now on its connectors. The latest version of SOTALogger’s spotting function works OK. The replacement transistor and addition to a fan in the amp, seems to have successfully got the amp through this activation. There was some “medical” smell for the first 5 minutes of so. I suspect this was the heatsink heat transfer compound that I used (meant for PC CPU chips) “burning in”. I will need to look at finding a better solution to reduce the number of adapters in the coax or atleast resolve the bad connections. The SOTALogger spotting via 3G function worked fine but I forgot to try it’s SMS option, so that still need to be tested.